August 2013 - Touch Display Research, Inc.
As published in our recent “ITO-Replacement: Non-ITO Transparent Conductor Technologies, Supply Chain and Market Forecast” report, there are already 19 companies and research institutes working on or shipping metal-mesh transparent conductors. On August 12th, California-based start-up Rolith announced that it has successfully fabricated metal-mesh type transparent conductors using proprietary nanolithography technology. It claims to have fabricated metal mesh of sub-micron width, and can achieve high transparency (>94% transmission) with a very low haze (~2%) and low resistivity (<14 Ohm/☐). Rolith was founded in 2008 by Dr. Boris Kobrin, Julian Zegelman, and Dr. Mark Brongersma. It received seed funding from Asahi Glass Corp in 2010 and has been developing nanolithography technology for “moth eye” structure for anti-reflection coating. Now, with the same technique and process, but changing the material to conductive ink and the mask pattern to grid pattern, Rolith is entering the ITO-replacement market. Many characteristics need to be considered when comparing different types of ITO replacement. The figure shown below compares the conductivity and cost. 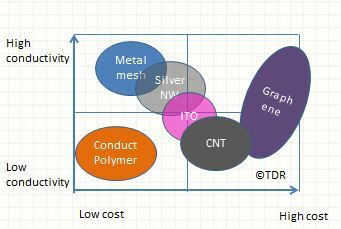 Source: Touch Display Research, ITO-replacement: non-ITO transparent conductor technologies, supply chain and market forecast report, May 2013 version. 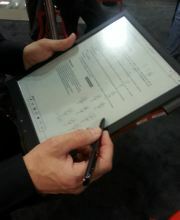 Touch Display Research forecast the ITO-replacement market will grow from $206 million this year to $4 billion by 2020. What are the challenges of Rolith’s technology? What are the advantages and disadvantages of metal mesh? More analysis can be found in our monthly Touch and Emerging Display Report. This entry was posted in Company News, ITO replacement, Touch screens and tagged Asahi Glass Corp, ITO Replacement, metal mesh, Rolith, start-up on August 13, 2013 by jennycolegrove.